In my running list of potential ingredient combinations, ice cream with quinoa was probably—no, definitely—near the bottom. But there we were on a Friday at 9 a.m., me and 20 high schoolers, happily munching homemade lemon sherbet studded with quinoa from the bottom of our paper bowls. I’d brought the grain and dessert to share with students at my alma mater Laguna Blanca, the plan being to talk a little about food and blogging and offer first something healthy and breakfasty (quinoa as cereal!) and then something sweet. In the frenzy of serving they ended up together, but what better lesson for young cooks than that making food is often a happy accident? I’m still a young cook myself, and ingredient adventures are no small part of my kitchen. Often the idea is not wholly my own: a month or so ago I was making a pasta casserole with one of my fellow apprentices when he suggested topping the dish with thinly sliced potatoes. Pasta and potatoes? Together? I tried (unsuccessfully) to veil my skepticism, but I was the one swallowing my words when we cut into our steaming casserole with its perfectly crisped potato topping. Who knew? This lemon sherbet is also the product of experimentation, particularly since I ended up making four batches over the course of last week. 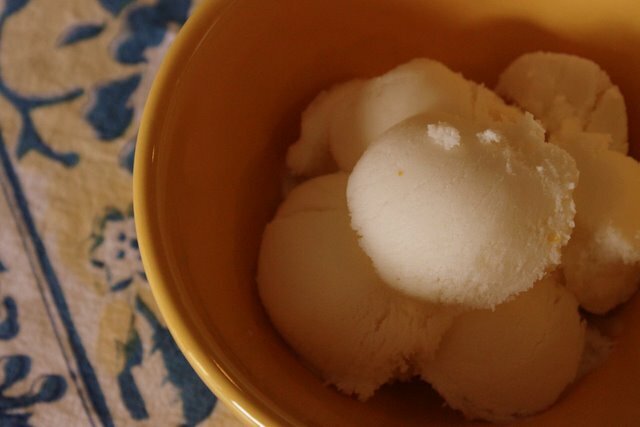 Some of you may remember the birthday ice cream maker I purchased for my mom back in October (an ulterior motive gift to be sure), and since my servings of iced desserts usually near half the quart, I decided to play around with ice cream and gelato’s svelter and oft-ignored cousin, sherbet. Made with milk instead of cream, sherbet falls somewhere between ice cream and sorbet, and using Jeni Britton’s ice cream-making method it is nothing short of delicious. The base for my final batch came out of the fridge a tad too tart, but as it was a bit late to add more sugar I spooned in some Avocado-blossom honey. Not quite as odd as potatoes on pasta, but a happy experiment nonetheless. 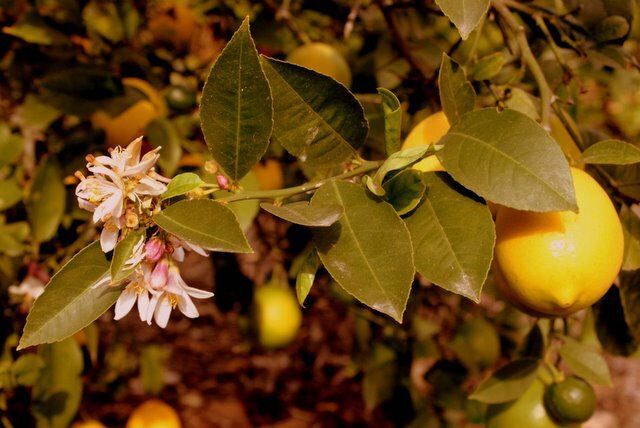 Meyer lemons have a characteristically mild and fragrant flavor which works wonderfully in sherbet, but I’ve made this recipe successfully with limes and other citrus so feel free to use what you have on hand. The same goes for the milk—I use 2%, but you can easily substitute according to preference. Whip cream cheese in a large bowl and set aside. Combine milk, sugar, and lemon zest in a saucepan over medium heat and slowly bring to a simmer. Dissolve cornstarch in a separate cup with a little of the milk from the pan, then pour into the main mixture when it begins to boil. Stir for a minute or so on the heat until the sherbet base thickens slightly, then pour onto the cream cheese and whisk vigorously until mixed. Set in the fridge or freezer to cool. 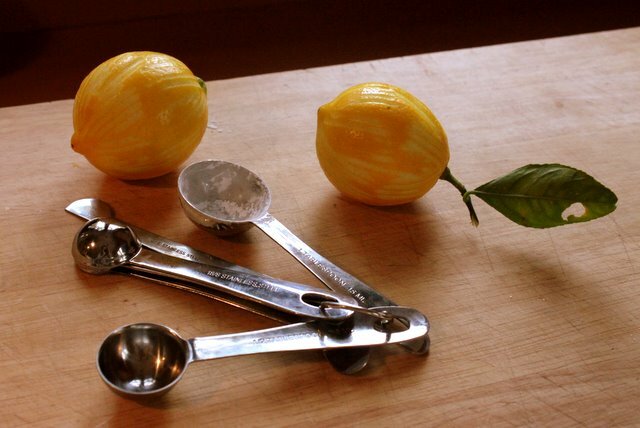 Juice your lemons and set aside. When the sherbet base is fully cooled, stir in honey and lemon juice a little at a time, tasting after each addition. When your base is the perfect combination of tart and sweet, freeze in your ice cream maker or follow these instructions for freezing your sherbet as a granita.